14 registered (Culminator, Paul F, Alistair, V8HENRY, Ricardo, TBM, Fox Terrier, EddieB, Phil Bleazey, Michael H, Oakvillian, Nonsuch, Neptune, Mark H), 132 Guests and 11 Spiders online. Wonderful fun these boys are having in their Packard Nationals - a new model to me. Great find Rich, I really enjoyed that. Not sure I would like to drive one on todays roads though. Reg, I got sent it by JTL it's a well presented video with a nice story. No a bit unwise on our roads these days. Hearing of Packards reminds me of Garfield Wood who ploughed the fortune he made from his hydraulic dump truck invention into powerboat racing. This culminated in Miss America X. 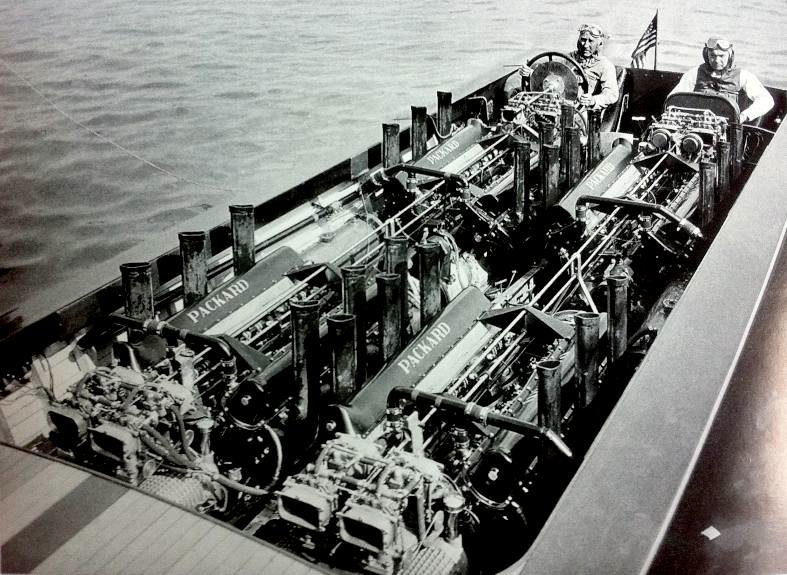 Hearing of a British challenge to the powerboat trophy he had held for nine years, using a pair of more powerful Rolls Royce engines, he added a further two V12 1600 hp Packard Aero engines. Each inline pair were carefully timed to run as one V24 engine to avoid drivetrain issues. A little tweaking got the total output to nearly 7000 hp! Needless to say he won in 1932 with a record speed of over 125 mph from the 39 foot long, 8 ton boat, and again the following year despite a closer British challenge. Oh that's a beauty and what a monster, I can't imagine that speed on water, 45 knots was the fastest I've been and that was quite quick enough for me. Just imagine the sound - wonderful. Reg I got it off a 90 in April chap . Hell I should still be getting breast fed if he is so good at his age . That would be a wild exposed ride but heaps of fun. Packard v8's were in our MTB's and MGB's during WW 2 , not a good place to be if hit by shells due to large petrol tanks.